Note : Your request will be directed to RFHIC. 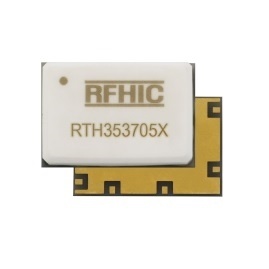 The RTH353705X is a fully matched Doherty GaN hybrid power amplifier module designed for 5G Massive MIMO systems, small cells, and low power remote radio head applications. This 2-stage power amplifier can deliver up to 5 watts of output power while operating from 3500 to 3700 MHz. It provides a gain of 26 dB with an efficiency of 42%. The amplifier is available in a 10.8 x 15.8 x 4.2 mm surface mount package.